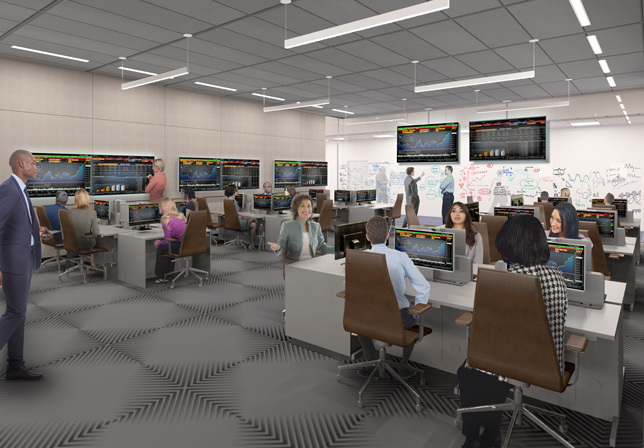 A rendering of the new finance and analytics lab that will be part of the University of Wisconsin–Madison School of business renovation. Source: UW–Madison. The School of Business at the University of Wisconsin–Madison has begun an $11 million remodel to convert its three-story building into a "learning commons." The new facility will include a state-of-the-art finance and analytics lab, active learning classrooms and ample numbers of collaborative spaces. The project, which covers 33,000 square feet, is expected to be done in spring 2018. The business school and the university's libraries worked together to develop the main themes for the renovation. Grainger Hall, the site of the construction work, currently houses academic spaces, a library, a computer lab, a business learning center and a copy center. When the project is done, the building will include changes on all three floors. The finance and analytics lab will be on the first floor. That facility will include cutting-edge business technology, such as Bloomberg Terminal, the flagship service from Bloomberg that will connect students and faculty to a fleet of financial and business tools and a worldwide community of users in finance, business and government. The first floor will also feature a collaborative area where students can interact in small or large groups. The second and third floors will house a transformed business library and business learning center with five active learning classrooms. Each of those will be capable of holding 24 students; two of the rooms will have the potential to accommodate groups of 50. The upper floors also will have 10 breakout rooms and casual seating; and the third floor will provide "comfortable seating" for individual quiet study. During the construction, the physical collection of the library has been placed in storage, while library services have been relocated elsewhere in the building to temporary quarters. The new learning commons is being funded privately by alumni and friends of the business school in partnership with the university's foundation. The project was kicked off by alumni Ricky and Mara Sandler, who made a "generous lead gift." Ricky Sandler runs Eminence Capital, a hedge fund estimated to be worth $5.5 billion. "The Learning Commons project builds on our investment in active learning spaces that incorporate technology and design to foster collaborative environments and support innovative teaching methods," said Suzanne Dove, assistant dean for academic innovations at the School of Business, in a prepared statement. She noted that the goal of the initiative was to create a central location "with flexible and customizable learning spaces that will enable students and faculty to connect, engage, and exchange ideas more than ever before." "We anticipate this project's outcome will serve as a foundation for the design of modern and transformed libraries on this campus," added Ed Van Gemert, vice provost for libraries and university librarian. The campus maintains nearly 30 separate libraries.